Staff was friendly and outgoing. Escorted up to our site, assisted us in backing in and made sure we were good to go before leaving. There are quite a few folks staying for 3-4 months during the summer, but they welcomed us right in, we made new friends and they gave us excellent information on dining in the area as well as things to do. The campground was nicely maintained, the bathrooms near the pool were the cleanest I've ever seen in a campground. The pool was great, and was kept clean the whole time we were there for a week. The lower sites are good if you want more shade, the upper sites offer more sun and views of the surrounding mountains. Make sure to sit on the deck outside the clubhouse in the evenings to watch the sun slip behind the mountains. We were disappointed in this campground as it was given Sam's highest rating. The spaces were extremely small and it was not friendly and welcoming. Upon our arrival we needed propane (which they advertised was available) only to be told there were out but didn't realize it. This was more like a homeowner association with the majority of sites being occupied by long-term residents vs. 'campers'. My husband and I stayed at this park for a month August 2017. The park is impeccably maintained. The pool was very refreshing on the hot North Carolina days. Restrooms/showers are roomy and clean. The owners are wonderful to work with. They go above and beyond to make your stay enjoyable. Will definitely return on our next visit. By far this is an excellent RV park. The owners and staff were friendly, pleasant and helpful. They help in assisting you to and backing into your site. The park has very clean restroom/baths, laundry facilities, and beautiful landscaping that’s well maintained. The pool area was in excellent condition. 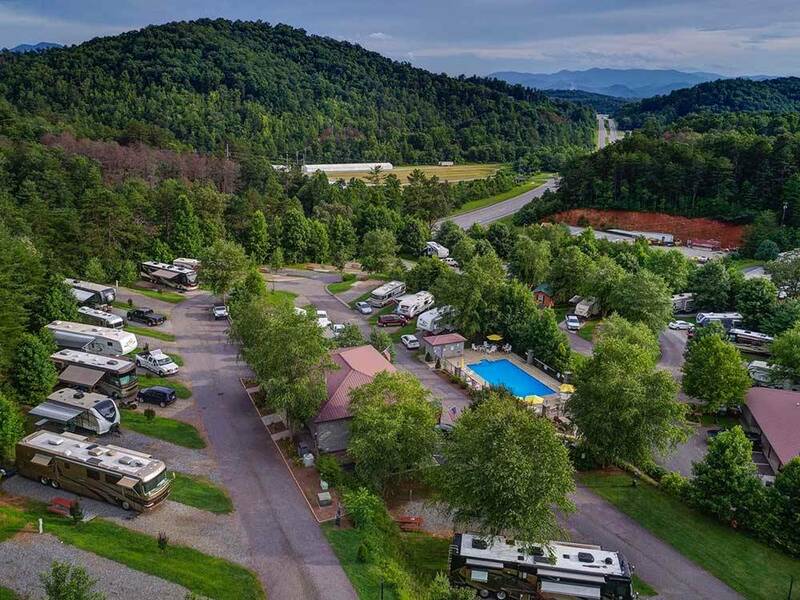 We stayed here for a week and have no issues in recommending this RV Park and will be staying here again. 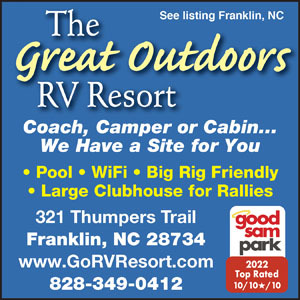 Owners of campground live on site, very friendly. Had small store for quick purchase of stuff. Owner escorted us to our site and helped my back in to site. I did have to use one leveling block to level camper side to side but not a very big deal. He explained all power, sewer and water connections before he left. The lower sites have better shade for the days, upper sites on the hill are good but not as shady. Wifi was great and about 50 HD TV channels. Nice are to walk around. Did have laundry and pool but did not use them. I paid $10 to wash our camper, it was worth it. Gravel lots but no pull thru. Over all a great place to relax and do nothing, that is what camping is all about, this place is great to do just that. Will bring a fire ring to your site but we did not use one. We will return here, it is only an hour from our house. Sites were close together and too short for some tow vehicles to park any way but sideways to the road. Fortunately, a staff person helped us back in. They will not reserve a specific spot for you so you get what they want you to have. Great views if your lucky enough to get a site where you can see them. Great Outdoors was clean and well laid out. Staff was very very helpful and friendly. Sites were flat gravel with a nice grassy area between each site. Picnic table also at each site. Restrooms, pool area and grounds were very clean. Staff was always picking up, cutting grass, etc. during our 7 day stay. This campground requires your rig be self contained so there were no tent sites, etc. We travel with motorcycles in our toy hauler and Great Outdoors is motorcycle friendly. Bikes were unloaded and parked right in front of our 5th wheel toy hauler. Parking the TV there also was tight but it fit in our site. Easy to find and very convenient to all the motorcycle roads in Western NC that we wanted to ride; Moonshiner 28, Tail of Dragon, Cherohalo, etc. Franklin, NC was 6 miles away and had anything you would need; shopping, groceries, great restaurants, etc. The campers seemed to split between longer term and short term. Everyone was very friendly and helpful. We will be back next year for at least another week. It was our first trip with our travel trailer. The people that we meet were very nice and helpful. The man that lead us to our site helped us back up into the site and then helped us hook up to the sewer, water, and cable. The man that was staying next to us also worked there and he helped my husband with the water heater. We enjoyed staying there. Definitely a '10' across the board. Staff and campers were very friendly. Facilities clean and well maintained. We always saw someone working on the landscape, cleaning restroom/bath facilities. Pool in excellent condition. Don't have one complaint. The staff was friendly and helpful. The facilities were immaculate. Th.e pool was warm and inviting. A great place to visit. Clean, comfortable, and quiet. The staff and the owner were friendly and helpful. Every amenity was clean and well cared fot. Grounds are very well kept, owners and staff were very very friendly and were very helpful in giving us good routes for our motorcycles. Restrooms are very clean and the pool area is nice. We were there for 10 days and would stay there again. Enjoyed the Saturday night bonfire they have too! !